It's November already! Sorry, I'm just coming to terms with the fact that it is no longer fall, but winter around here, and every afternoon struggle to get the snowsuits and warm gear on for our walk is a reminder that the lazy days of summer are truly gone. Although we have no snow yet, the frigid wind biting our cheeks and noses whispers that it is not far off. Brrr. If it seems like all I have been posting lately is sweets and more sweets, you're right, and I have more of the same coming up, so I hope you don't mind. I don't know why it works out like that; we DO eat stuff other than apple pie and apple cake, but I usually figure you wouldn't be too interested in our day-to-day casual comfort fare. I mean, autumn beef stew and chicken-leek pot pie is pretty ho-hum, you know what I mean? 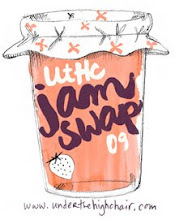 So here is another round of recipes requiring that you dig deep in to that sugar barrel and reach for some spices: It's Pumpkin Week on UtHC! Stop! Do not throw out those Halloween pumpkins! We went to a patch recently where I picked up several pumpkins for decorations on the front steps because they were just so pretty. Well, I hate waste, so eventually they were roasted, pureed up and turned in to all sorts of delectable things. And so I give you Playing with Pumpkin, a four part series featuring the humble squash...and, what's this, some toys? Huh? What's the fun of having a blog if one can't play around a little, right? A few years ago, in one of those freak garage sale finds, I discovered a super cute, retro kitchen set and picked it up for Noah, who was still an infant. 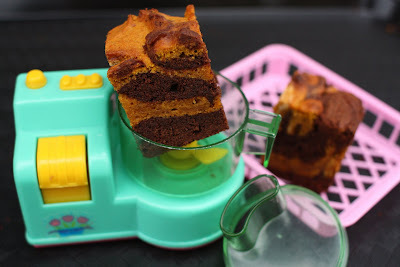 The mini appliances have had a lot of use since then, as now, when I am baking, Noah sets them up alongside my Kitchen Aid and I let him use real ingredients to make...well, a huge mess, really. They have such fun, bright colors and I couldn't resist pairing them with treats from my recent baking marathon. Part 1 of Playing with Pumpkin features a mini food processor with a removable lid and blades that really turn when you press the button! What fun! 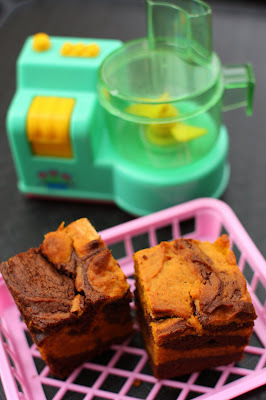 We first baked these Pumpkin Swirl Brownies, a recipe that caught my attention on Martha Stewart, and then again over at Smitten Kitchen. Deb's photo's were enough to make me bookmark the recipe in my "Foods to make ASAP" file (that's right, not just "sometime in the future, but NOW" folder) and after a quick check of ingredients, Noah and I got down to the business of melting chocolate and cracking eggs, while Mateo played happily on the floor with the measuring spoons. Oh, the only bummer about this recipe is that it makes a of of dishes--or plenty of bowls and spatulas to lick, depending on how you look at it! They taste fabulous, not overly sweet, not to 'squashy'. 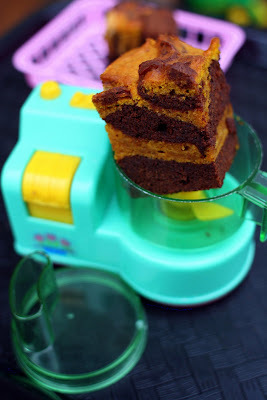 If you like how chocolate and zucchini go together, then you must try these brownies. I did have a hard time calling them 'brownies', though, they are more like a cake or perhaps a bar. I'm sorry, but a brownie has to have a certain gooeyness about it for me. One last thing, I used my own pumpkin for this recipe. I purchased the smaller sugar pumpkins, halved them and roasted them off in the oven. Then I pureed the flesh with a multiquick, one of my Top 10 Favorite Kitchen Items, and hung it in a cheesecloth for an hour or two to get rid of the excess liquid. Works like a charm and leaves me with a firm pumpkin puree that's a lot milder than the canned stuff. 1. Preheat oven to 350 degrees. Butter a 9-inch square baking pan or dish. Line bottom of pan with parchment paper; butter lining. 2. Melt chocolate and butter in a heatproof bowl set over a pan of simmering water, stirring occasionally until smooth. 3. Whisk together flour, baking powder, cayenne, and salt in a large bowl; set aside. Put sugar, eggs, and vanilla in the bowl of an electric mixer fitted with the paddle attachment; beat until fluffy and well combined, 3 to 5 minutes. Beat in flour mixture. 4. Divide batter between two medium bowls (about 2 cups per bowl). Stir chocolate mixture into one bowl. In other bowl, stir in pumpkin, oil, cinnamon, and nutmeg. Transfer half of chocolate batter to prepared pan smoothing top with a rubber spatula. Top with half of pumpkin batter. Repeat to make one more chocolate layer and one more pumpkin layer. Work quickly so batters don't set. 5. With a small spatula or a table knife, gently swirl the two batters to create a marbled effect. 6. Bake until set, 40 to 45 minutes. Let cool in pan on a wire rack. Cut into 16 squares. Love those toys!! Too cute. I'll now be on the look out for some for our little guy for when he is older. Was just trying to figure out what to do with all my display pumpkins and these brownies look great. I do have one question - are you able to freeze them? We're trying to cut down on the sweets now, but they'd make great Xmas sweets. They turned out really good. I love pumpkin recipes. My pumpkin bars were a hit at a party. Those look good but I'm just not sure about pumpkin and chocolate together. Very cute toys. My babygirl loves to bully, I mean help me in the kitchen, too! LOL! 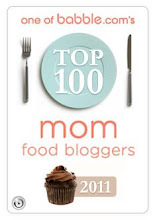 I saw these on Smitten Kitchen's blog, yours look gorgeous! these look so good! i've been seeing them around lately but have resisted. i guess i should stop fooling and just go ahead and make them! you are too ambitious! am i a failure if i just use canned pumpkin? 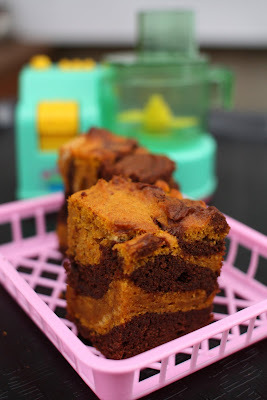 These look kinda similar to some pumpkin brownies I made recently. I liked them, but I wanted more pumpkin flavor. The chocolate kind of took over! Your pics are pretty! Hmm, I never thought to drain the puree before using. Great idea! Looking forward to your other recipes. 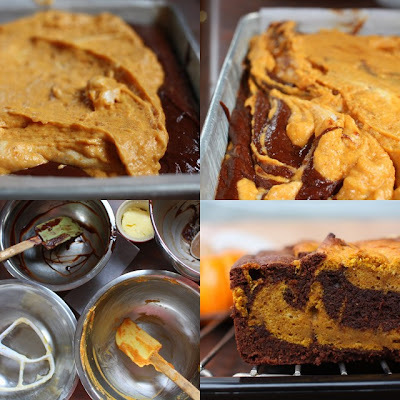 We tried the pumpkin bread from October Gourmet. Very yummy with roasted pumpkin seeds on top. Yeah, I'm looking forward to the pumpkin series! These brownies are the perfect start. I love that Noah bakes alonside you. Hi Suzanna- They did dry out a little when I froze them, but I froze them individually, so maybe they would do better in a slab. Hi Gillian- Perfect! Hope to inspire. Hi Helene- Thanks! I bet your bars were awesome. Hi Val- Am I leading you astray? Oh no! Hi Ingrid- OK so you know what it's like working with a 'helper'. Hi Stacey- Thanks! Inspired by Deb, of course. Hi Kickpleat- They are worth it just for the fun of swirling them. You can probably get a better marble than I did, though. Hi abigail- No way! You'll get a nice orange color, too. Hi Recipegirl- Thanks! These have plenty of pumpkin flavor. Hi Cheryl- ohh that sounds good. HI Lynn- Yep, he even has his own apron. 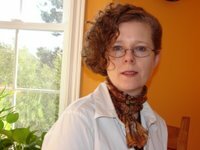 just because you are you... How about a blog award? Congratulations! I love those toys! We have the blender whose blades turn when you push the button. All three kids love that thing! Those brownies/bars/whatever you wanna call them look delicious! I have a huge pumpkin I have to roast soon so this is going on the list of "things to make with all that pumpkin puree"! Yay for pumpkin week! I can never have too many pumpkin recipes. And this one looks fantastic! Mmm pot pie sounds good, but so do these brownies. Everyone has been doind the chocolate and pumpkin combo! I've never tried it before. Me too! I want your Chicken leek pot pie recipe. I don't like baking but I like cooking so lets get on with the real food! Hi Abigail- Sweet!! You made my day! Hi Lyb- The kids will be glad you made these! Hi Deb- A pumpkin enthusiast for sure! Hi Em- Thanks!It's that time of year for pot pie. Hey I did a turkey, that's pretty 'real', no? Adorable! My sons love to help me cook and bake, too--but my husband would flip at the pink tools. I found a blue, boyish-looking version of an EZ bake oven I'd like to get them this year--should be fun baking our own little treats! Those brownies look delicious. These look great, must make soon! I made pumpkin cakey bread the other day and added a cup of 60% cocoa Ghirardelli chocolate chips, a handful of candied ginger, chopped, and golden raisins. It was awesome. I had to use a cake pan, which was good, but will definitely make muffins next time! I doubled the recipe, using a 15 oz can of pumpkin, and used pumpkin pie spice and some fresh ground cinnamon in place of the suggested cinnamon and ginger.Didn't have the pepitas, but what I had was great. May add pecan next time. The double batch made one super 9" round pan. It was a bit gooey in the middle and fully cooked on the outside. Cooked about 45 minutes, knife came out clean but the center was almost too raw, whereas edge was cakey-bready-perfect, like a nice zucchini bread. I have made this dessert very often, to a point where I now get cravings for it if I haven't eaten it in a while.